A man once told me that if he could be assured that he would never have to go to the poorhouse, and that he would have the necessities of life for his family, he would be perfectly satisfied. He said it was evidently not intended that he should have luxuries or anything more than a bare living; he had always been a poor man and he always expected to be poor, that his people before him had also been poor. 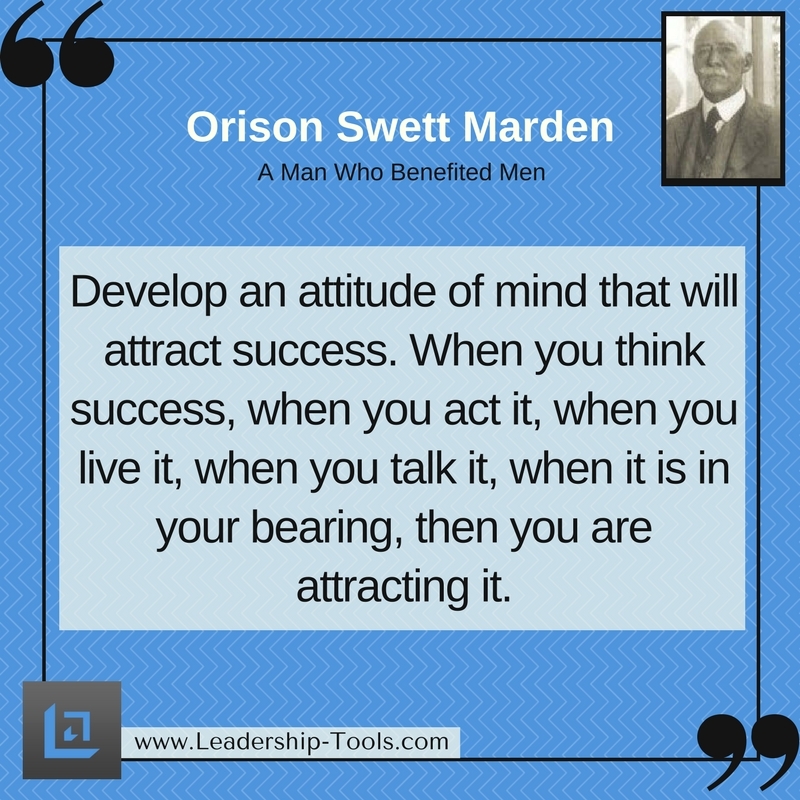 Now, it was just this mental attitude, — for he was a hard worker, — of always expecting to be poor, believing he would always be poor, that kept him from attracting prosperity. He had not expected prosperity and, of course, could not attract what he did not expect. He only just managed to get along, for that was all he expected to do. 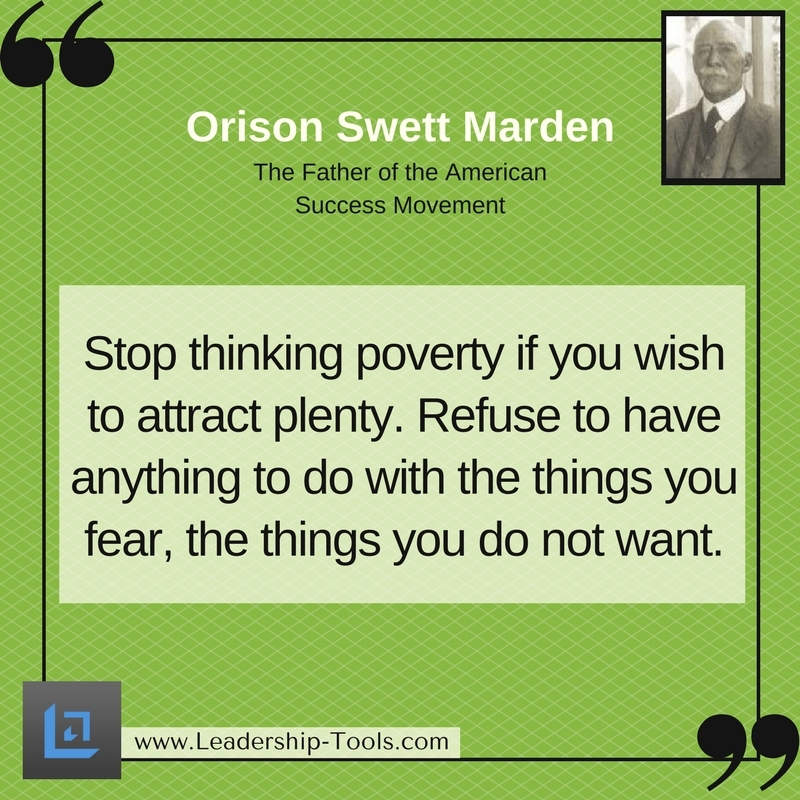 Stop thinking poverty if you wish to attract plenty. One of the chief reasons why the great mass of human beings live such mean, stingy, poverty-stricken lives is because their negative mental attitudes, their doubts and fears and worries, their lack of faith, attract these conditions. The Good Book tells us that "the destruction of the poor is their poverty." That is, their poverty thought, their poverty conviction, their poverty expectation and poverty belief, their general hopeless mental outlook keeps away prosperity. The worst thing about poverty is the poverty thought, the poverty belief. Multitudes of people never expect to be comfortable, to say nothing of having the luxuries and refinements of life. 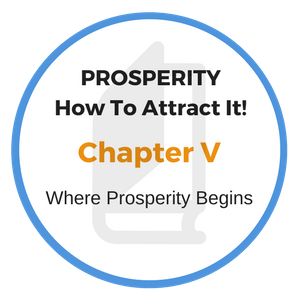 They expect poverty, and they do not understand that this very expectancy increases the power of their mental magnet to attract want and limitation, even though they are trying to get away from it; that we always head towards our expectations and convictions. Poverty begins in the mind. The majority of poor people remain poor because they are mental paupers to begin with. They don't believe they are ever going to be prosperous. Fate, conditions are against them; they were born poor and they expect always to be poor, — that is their unvarying trend of thought, their fixed conviction. Go among the very poor in the slums and you will find them always talking poverty, bewailing their fate, their hard luck, the cruelty and injustice of society. They will tell you how they are ground down by the upper classes, kept down by their greedy employers, or by an unjust order of things which they can't change. They think of themselves as victims instead of victors, as conquered instead of conquerors. The great trouble with most people who fail to realize their ambition is that they face life the wrong way. They do not understand the tremendous potency of the influence of the habitual mental attitude in shaping the career and actually creating conditions. It is really pitiful to see people making slaves of themselves trying to get ahead, but all the time side-tracking the good things which would come their way if they did not head them off by their conviction that there is nothing much in the world for them anyway, nothing more than a bare living at the best. They are actually driving away the very things which might flow to them in abundance if they held the right mental attitude. In every walk of life we see men and women driving away the things they want. Most people think the things they do not want. They go through life trying to build happy, prosperous, healthful lives out of negative, destructive thinking, always neutralizing the results of their hard work. They indulge in worries, in fears and envies, in thoughts of hatred and revenge, and carry habitually a mental attitude, which means destruction to health, growth, and creative possibility. Their lives are pitched to a minor key. There is always a downward tendency in their thought and conversation. Nine-tenths of the people in the world who complain of being poor and failures are headed in the wrong direction, headed right away from the condition or thing they long for. What they need is to be turned about so that they will face their goal instead of turning their backs on it by their destructive thinking and going in the other direction. "Stop thinking trouble if you want to attract its opposite; Refuse to have anything to do with the things you fear, the things you do not want." The Morgans, the Wanamakers, the Marshall Fields, the Schwabs, think prosperity, and they get it. They don't anticipate poverty; they don't anticipate failure; they know they are going to be prosperous and successful, because they have eliminated all doubt from, their minds. Doubt is the factor which kills success, just as the fear of failure kills prosperity. Everything is mental first, whether failure or success. Everything passes through our consciousness before it is a reality. Multitudes of people who work hard and try hard in every way to get on would be shocked if they could see a mental picture of themselves headed toward the poorhouse, in fact, as they actually are in thought. They do not know that, by an inexorable law, they must head toward their mental attitude, that when they continually think and talk poverty and suggest it by their slovenly dress, their personal appearance, and by their environment, when they predict that there is nothing for them but poverty, that they will always be poor, no matter how hard they may work. They do not know that their doubts and fears and poverty-stricken convictions are making prosperity impossible for them. They do not know that as long as they hold such thoughts they cannot possibly head toward the goal of prosperity. "The man who sows failure thoughts, poverty thoughts, can no more reap success, prosperity harvests, than a farmer can get a wheat crop from sowing thistles. No matter how hard you may work, if you keep your mind saturated with poverty thoughts, poverty pictures, you are driving away the very thing you are pursuing." The sum total of our life is that upon which we have concentrated. If poverty or opulence, if success or failure, if prosperity or want has occupied our minds, if we have focused our attention upon one of these, that is just what we shall see incorporated in our life. What you have, my friend, what you have surrounded yourself with, is a reproduction of your thought, your faith, your belief in your efforts; is what you have been conscious of. Our thoughts, our faith, our beliefs, our efforts, all materialize, and are objectified about us. Our words become flesh and live with us; our thoughts, our emotions, become flesh and live with us; they become our environment and surround us. There is only one way to get away from poverty, and that is to turn your back upon it. Begin right away by putting the poverty thought, the poverty fear, out of your mind. Assume as far as possible a prosperous appearance; think the way you want to go; expect to get what you are after, the thing you long for, and you will get it. Mentally and physically, in your clothing, in your surroundings, in your home, in your bearing, erase, as far as you can, all marks of poverty. Affirm with Wait Whitman, "I myself am good fortune." Don't let slovenliness in your home, shabbiness in your children or wife, be an unfavorable advertisement of you. The fear of poverty is its greatest power. That is what gives it its stranglehold on the masses. Get rid of your fear of it, my friend. Let the prosperity thought take the place of the poverty thought, the poverty fear, in your mind. If you have been unfortunate, don't advertise your discouragement. Brush up, brace up, dress up, clean up; and above all — look up and think up! Remember that a stream of plenty will not flow towards a poverty-saturated thought. A pinched, stingy thought means scanty supply. Thinking abundance, opulence, and defying limitations will open up the mind and set the thought currents towards greatly increased supply. If all the poverty-stricken people in the world today would quit thinking poverty, quit dwelling on it, worrying about it and fearing it; if they would wipe the poverty thought out of their minds; if they would cut off mentally all relations with poverty and substitute the opulent thought, the prosperity thought, the mental attitude that faces toward prosperity, the change in their condition would be amazing. The Creator never made a man to be poor. There is nothing in his constitution which fits drudgery and poverty. Man was made for prosperity, happiness, and success. He was not made to suffer any more than he was made to be insane or to be a criminal. Thousands of people have literally thought themselves away from a life of poverty by getting a glimpse of that great fundamental principle — that we tend to realize in the life what we persistently hold in the thought and vigorously struggle toward. Don't think that by holding the constructive, creative thought only now and then, or just when you may happen to feel like it, that it is going to counteract the influence of holding the destructive thought most of the time. Lots of people who treat for prosperity and opulence, hold the want thought, the lack thought too, and that is the reason their prayer is not answered. They get just the opposite, because that is the thought, the expectation which predominates in the mind. Our conviction is much stronger than our will power. No will power can help you to do a thing when convinced that you can't. For instance, if you are convinced that a fatal disease which you believe you have inherited is overcoming you, this thought is infinitely stronger than your will to prevent it. We cannot get away from our convictions. These are being built into the mind, being built into the life and character. If you are convinced that you are going to be poor, that you are never going to be prosperous, no matter how hard you may work, your convictions will triumph and you will live and die in penury. A man will never be anything but a beggar while he thinks beggarly thoughts. If you are living in the thought of limitation, the conviction of lack and want, the fear of poverty, the belief that you can never become prosperous, you are holding yourself down, keeping yourself back. You are sowing seed which must produce a harvest like itself. The boy who sows his wild oats seed might as well expect to get just the opposite harvest as for you to saturate your mind with poverty thoughts, lack, want, limitation thoughts, and expect a prosperity harvest. If you are thinking poverty-stricken thoughts, saturating your mind with limitation thoughts, you must expect a corresponding harvest and you will get it whether you expect it or not. "It is doubting and facing the wrong way, facing towards the black, depressing, hopeless outlook that kills effort and paralyzes ambition." In my youth one of the hardest things in the Bible for me to understand was the statement, "To him that hath shall be given." I couldn't reconcile this with the Bible. It seemed positively unjust. But now I know that it illustrates a law. "To him that hath shall be given," because in getting what he has a man has made his mind a magnet to attract more. On the other hand, "To him that hath little, that which he hath shall be taken away," because he is headed in the wrong direction mentally. He is closing the avenues of supply by his little thoughts, his doubts and fears. He is in no mental condition to get more, to attract more. If you want to demonstrate prosperity, you must think prosperity; you must hold your mind everlastingly toward prosperity; you must saturate your mind with it, just as a law student must saturate his mind with law, must think it, must read it, must talk it, must keep with lawyers and in a law atmosphere as much as possible, to be successful as a lawyer. It was intended that we should have an abundance of the good things of the universe. None of them are withheld from us except by our poverty-stricken mental attitude. There is no more possible lack for a human being of all that the heart can wish for than there is lack of water or food supply for the fish in the great ocean. The fish swims in the ocean of supply, as we swim in the great cosmic ocean of supply that is all around us. All we have to do is to open our minds, our faith, our confidence, to its reality, and use our intelligent effort to get all the good there is in it, — that is everything we need and desire.